2018 MV Agusta Turismo Veloce 800 RC. Picture credits - MV Agusta. Submit more pictures. The construction of this top of the range motorcycle is further enriched by virtue of the RC version, which will be produced in a limited edition of 250 pieces. Recognizable primarily for specific racing livery, characteristically aligned to the other precious RC models. Front suspension: Marzocchi �UPSIDE DOWN� telescopic hydraulic fork with rebound-compression damping and spring preload external and separate adjustment. Front brakes: Double disc. ABS. Brembo. Rear brakes: Single disc. ABS. Brembo. Wheels: Aluminium alloy. Red rims. Electrical: 12V 11 Ah battery. Ask questions Join the 18 MV Agusta Turismo Veloce 800 RC discussion group or the general MV Agusta discussion group. Bikez.biz has an efficient motorcycle classifieds. Ads are free. Click here to sell a used 2018 MV Agusta Turismo Veloce 800 RC or advertise any other MC for sale. 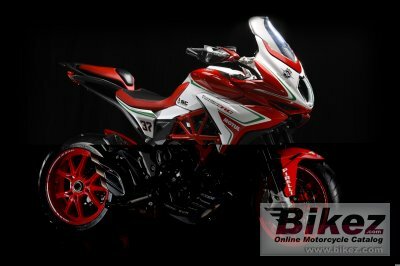 You can list all 2018 MV Agusta Turismo Veloce 800 RC available and also sign up for e-mail notification when such bikes are advertised in the future. Bikez has a high number of users looking for used bikes. Before you buy this bike, you should view the list of related motorbikes Compare technical specs. Look at photos. And check out the rating of the bike's engine performance, repair costs, etc.